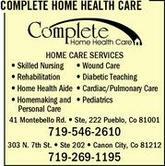 Complete Home Healthcare is a reputed and certified Medicaid/Medicare home care agency that serve clients across the regions of Denver, Boulder, Greenwood Village, Colorado Springs, Brighton, Longmont, Canon City and Pueblo. The company thrives on offering beneficial services to their clients and family members and also adapt in various forms to acquire a leading position in the industry of home healthcare. They also encourage various clients, including their family members so that they would participate in various experiences of home care, actively. The company started operations in 1992. They even offer highest reputation throughout medical community and offer unique treatment facilities. There are currently 0 consumer reviews about Complete Home Health Care available. Share your review. Please take a note that you are about to post a public review about Complete Home Health Care corporate office on CorporateOffice.com. This review will be public, so please do not post any of your personal information on this website. If you would like to contact the corporate offices of Complete Home Health Care, please use their contact information such as their phone number, website, and address listed above to contact them. However, sometimes staff from Complete Home Health Care headquarters do read the reviews on this website.